The stout broomstick-like stems have attractive wrinkled leaves and ivory white 'cushion' flowers which bloom on tall stems from June to October. A rare and spectacular addition to any garden. 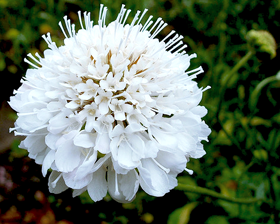 Sow scabiosa seeds February to July on the surface of any moist seed compost and cover with compost or vermiculite to the depth of the seeds. Place in a propagator or warm place, and keep at a temperature of between 18-21ºC. Germination will usually take 10-21 days.